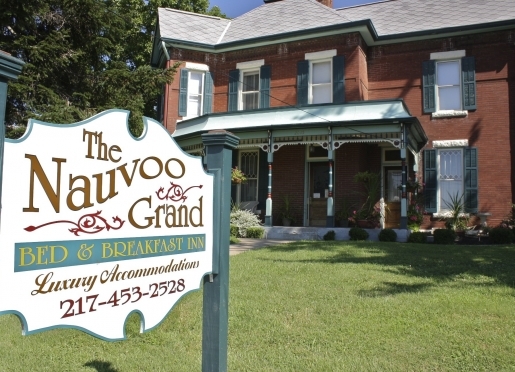 Just up Parley Street from the Midwest's largest collection of restored historic preservation sites, nestled behind a canopy of 145-year-old trees, sits an unexpected historic treasure, the Nauvoo Grand. 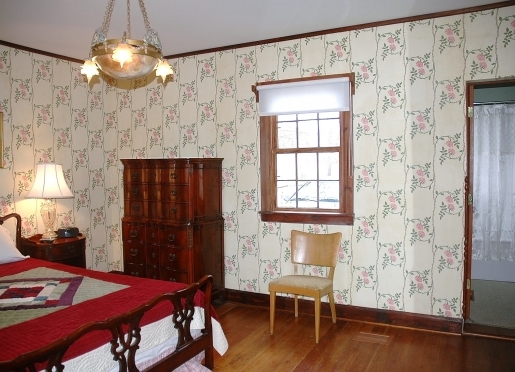 Please call today and make your reservation to enjoy the best of Nauvoo in an intimate historic setting surrounded by idyllic orchards and vineyards! 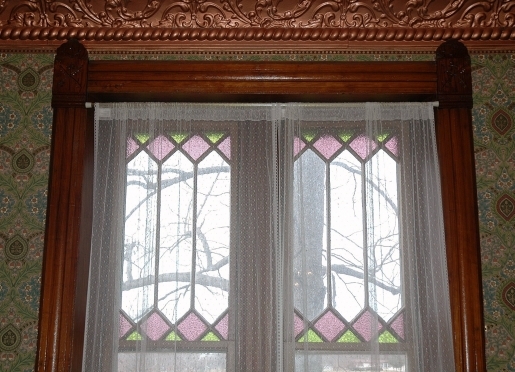 This turn-of-the-century home was built in1905 by Cecil J. Baxter whose family had come to Nauvoo with the Icarian movement in 1855. 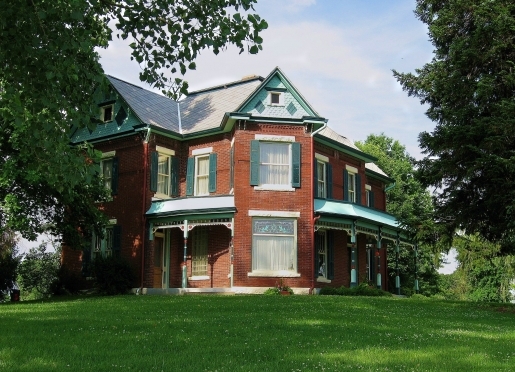 The Baxter home was built over an old Mormon homestead that was originally on the site. The basement walls display a number of stones salvaged from the original Nauvoo Temple that is located just a few blocks away. 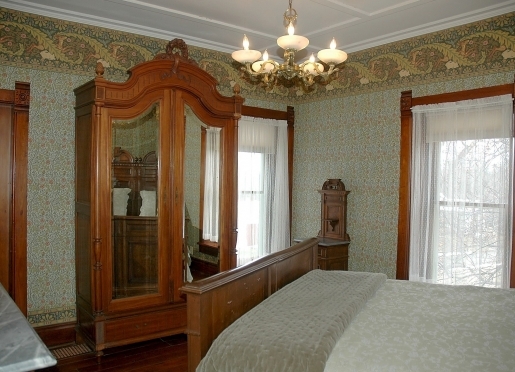 Today, the Baxter home has been transformed by Cassie and Kent Barrett into Nauvoo's only luxury accommodations, offering the grace and intimacy of Victorian times. 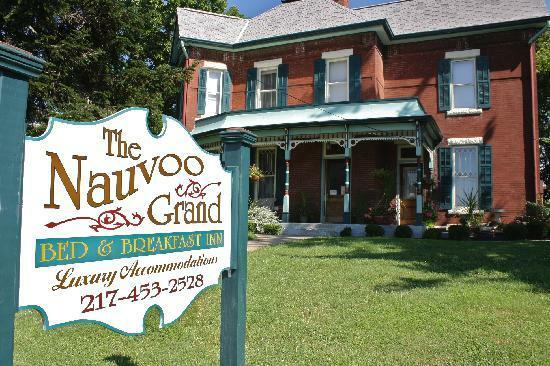 Perched on a gentle rise, the Nauvoo Grand is still surrounded by the Baxter family vineyards and sits directly across the street from Illinois' oldest winery, owned and operated by fifth generation of the Baxter family, Brenda & Kelly Logan. Travelers are always looking for memorable and relaxing experiences. Let’s discover more through the words of our innkeepers. Many thanks to Cassie and Kent Barrett for sharing their own secrets with BBOnline.com! Most of our travelers are visiting the world-class historic sites that date to the 1840’s in our National Historic Landmark District. We are also a favored stop on the Great River Road, a national scenic by-way that features breathtaking views of the Mississippi River. 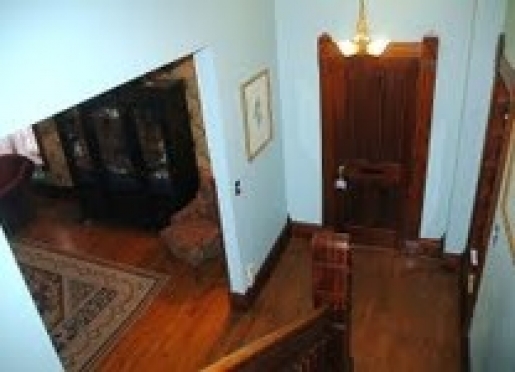 We are best known for our proximity to the historic sites mentioned in the first item. 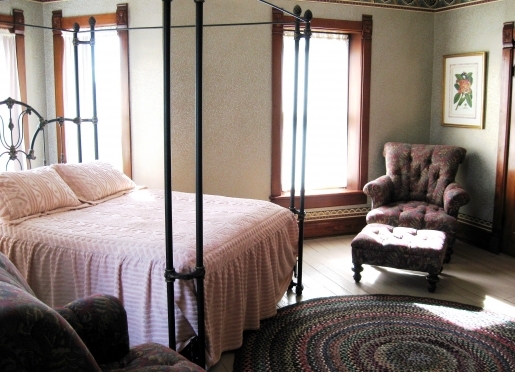 Our bed and breakfast is unique in that we are one of two bed and breakfasts in Nauvoo that serve a hot breakfast each morning. 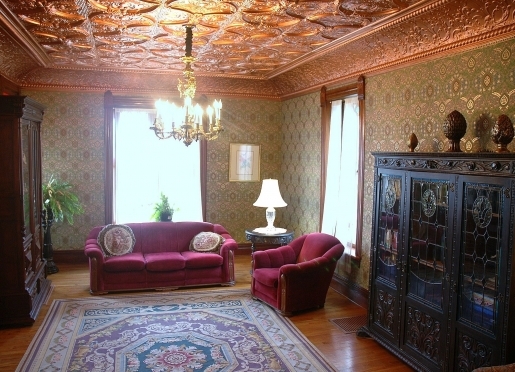 I personally love the original tin ceilings and stained glass windows on the first floor of the home. Additionally, my great-great grandparents built the house that I now have the privilege of taking care of and welcoming guests into. 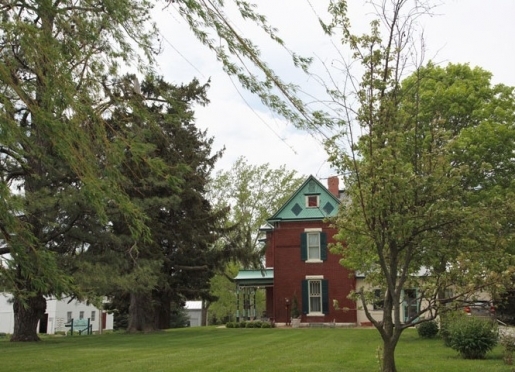 The #1 reason to come to Nauvoo is to unplug and relax while visiting the historic district or taking in the beauty of rural life in the Midwest. Our best compliment that we have ever received at the bed and breakfast is about the breakfasts served each morning – every morning Brenda, Peggy or Kim will serve our guests a completely different menu from our selection of tried and tested recipes. 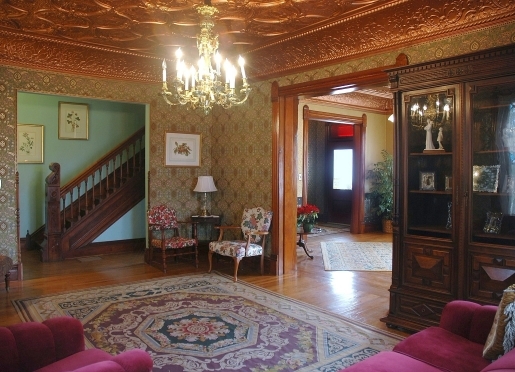 The area is home to all kinds of things to do and the bed and breakfast is located directly across the street from Illinois’s oldest winery – even if you don’t drink wine, the story behind the family is fascinating. 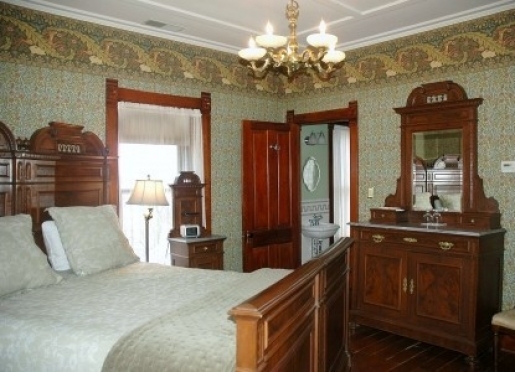 A traveler staying for four nights could see multiple historic sites, relax along the mighty Mississippi, visit our friends in nearby Keokuk, Ft. Madison, Burlington, Iowa and/or Quincy, Illinois. Each of our region’s cities offers a different view of the Mississippi River, some unique eats and an abundance of history. Baxter’s Vineyards and Winery is located directly across the street from the bed and breakfast and features a small wine bar, a tasting room and gift shop along with Carol’s Pies and Nauvoo Nibbles. The Nauvoo State Park is also within walking distance as is the National Historic Landmark District of Nauvoo. 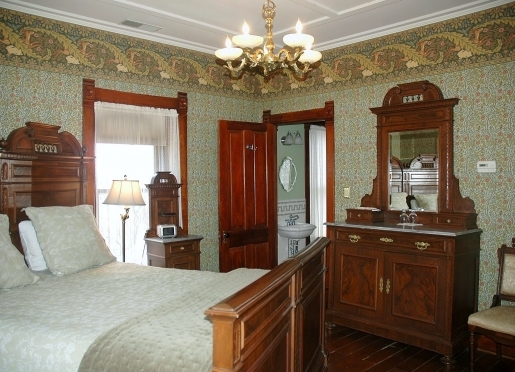 Hotel Nauvoo, a third-generation business located in the heart of Nauvoo is a jewel for our area. 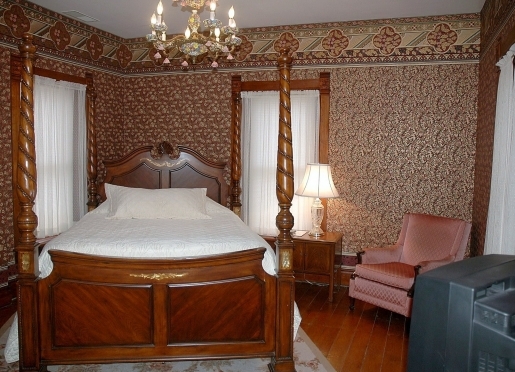 Hotel Nauvoo features a very large, home-cooked buffet that they are very well known for. They also have the option of ordering ala carte from their menu. 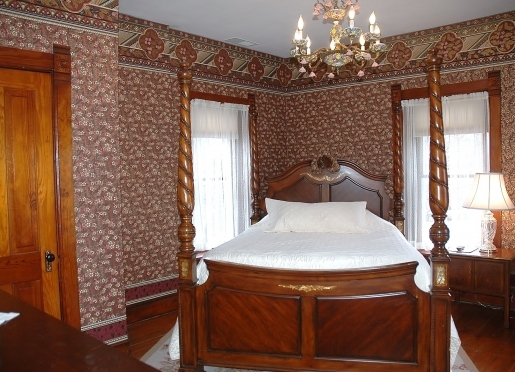 www.beautifulnauvoo.com, www.SeeNauvoo.com, and www.HistoricNauvoo.net are all great resources for the area. We generally do not accept pets, however, we have made a few exceptions. I would encourage our guests to contact us directly in this instance. Our neighboring community of Hamilton, Illinois offers a boarding service that we have also referred guests to. 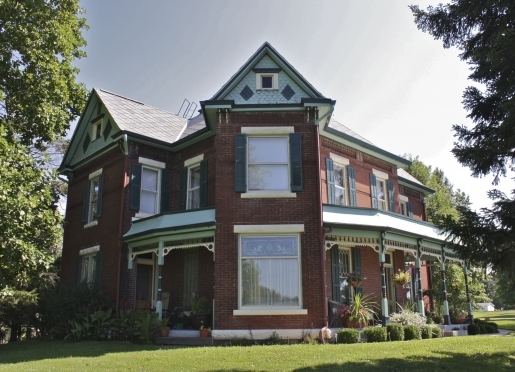 As you approach the Nauvoo Grand, you will note the exquisitely detailed brick and the elaborate Victorian trim under the eaves and around the front and side porches. 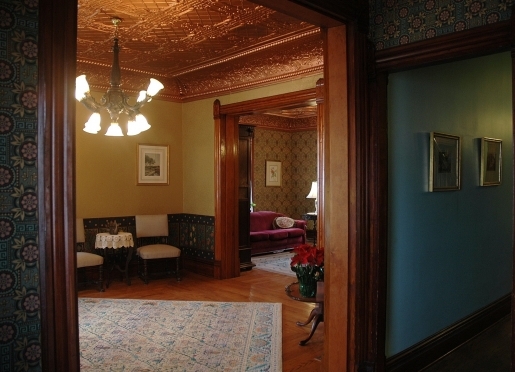 After stepping through the carved front door, your eyes will immediately be drawn to the dramatic copper-colored pressed metal ceilings in the entry, which extend throughout most of the main floor and complement the restored copper door hardware found throughout the home.In addition to your private bedchambers, all of our guests enjoy access to our main floor library, where you can sit in comfort with a good book or good friends beneath the beautiful copper-colored tin ceilings and exquisite antique chandelier and look out to the vineyards and orchards to the south and north. 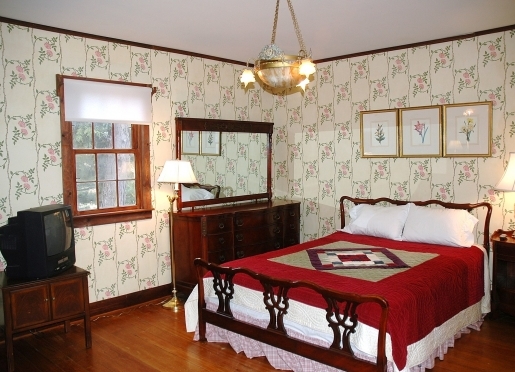 Each of our bed chambers is furnished with beautiful antiques and offers private bath, cable television, DVD player and radio/CD. 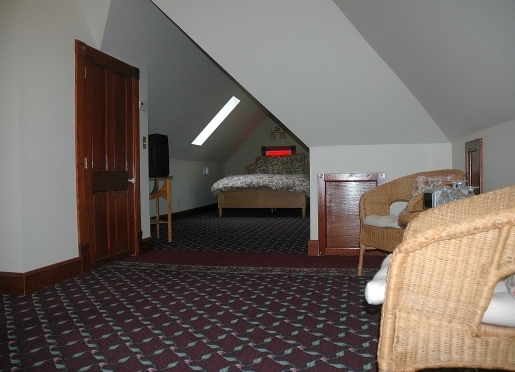 Wireless Internet is also available free of charge for our guests. 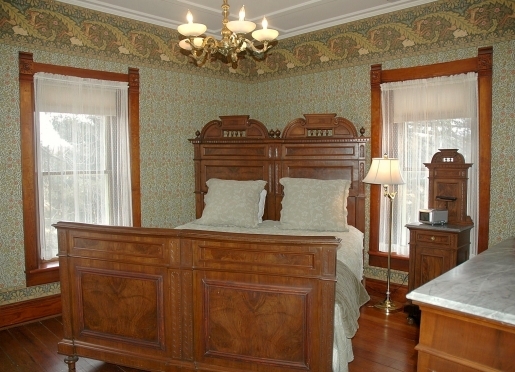 three antique-filled bed chambers, each with private bath (one not attached) and beautiful views of the one-acre grounds and surrounding vineyards and orchards. Two of the baths feature jetted tubs. 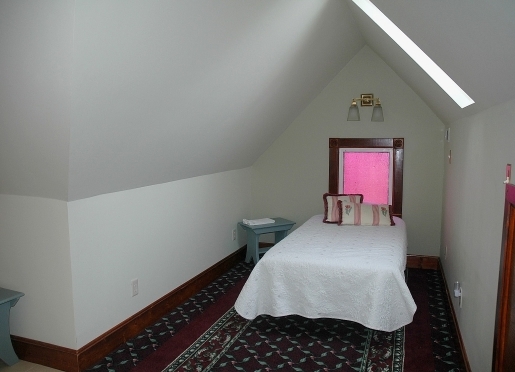 From the second floor another staircase takes you to "Eleanor's Attic" which encompasses the entire third floor with a queen size bed in one sleeping area, two twins in another and its own private bath. Historic Nauvoo consists of a large number of restored homes and buildings on the flats staffed by tour guides in period clothing, including several private homes, meeting halls and businesses (bakery, brickyard, gun shop, blacksmith, wheelwright, drug store, school, printing office, tin shop, land and records office), as well as a large visitors center and memorial gardens. 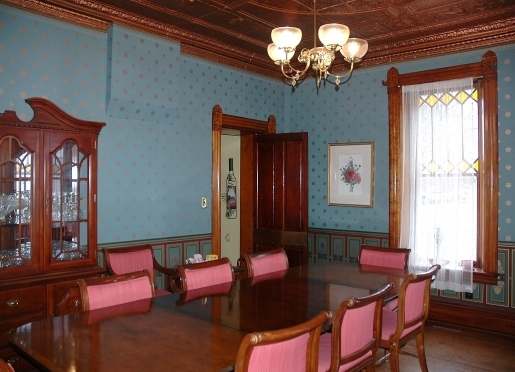 The Joseph Smith Historic Center offers guided walking tours of the Joseph Smith Homestead, Mansion House, Red Brick Store, Nauvoo House and Smith Family Cemetery. The 148-acre park directly across from the restored historic flats includes a 13-acre lake with mile-long shoreline and offers fishing, boating, camping, and hiking along with 20 acres of playground and picnic areas. Illinois' oldest winery features complimentary tasting, tours, hand-made gifts by area craftsmen and specialty foods (including Carol's homemade pies and sweet breads). Perhaps nowhere else can a town of 1100 inhabitants boast such a varied and tumultuous past or such a bright and exciting future. In Nauvoo, the mighty Mississippi bends around an eight-mile curve of fertile farmland ("the flats"). About a mile inland, the land rises about 60 feet up to level grasslands ("the bluff") which extend eastward to the horizon. Tradition has it that this one-time Indian village of 400 to 500 lodges called "Quashquema" was traded for two hundred sacks of corn in 1824 to Captain James White, who ran a ferry and traded with the Indians. In 1830 a post office was established for the tiny settlement under the name of "Venus," which was changed not long thereafter to "Commerce." The incredible transformation of the area began in 1839 when Joseph Smith, Jr. purchased 170 acres for a settlement of the members of the Church of Jesus Christ of Latter-day Saints. After having been driven out of Ohio and Missouri, the "Saints" descended upon what was a mosquito-ridden swamp and began to build a city named "Nauvoo," a Hebrew word suggesting "a beautiful place." Soon wagons and tents gave way to log cabins, then frame houses and, finally, brick homes and businesses. Within five years, the population had swelled to 12,000, nearly as large as Chicago, with grist and lumber mills, potteries, tanneries, foundries, brickyards, bakeries, a slaughter house, comb and match factories and dozens of shops, stores and other businesses. During the five years of its construction, men gave every tenth day to cut, haul and place wooden timbers and limestone blocks. 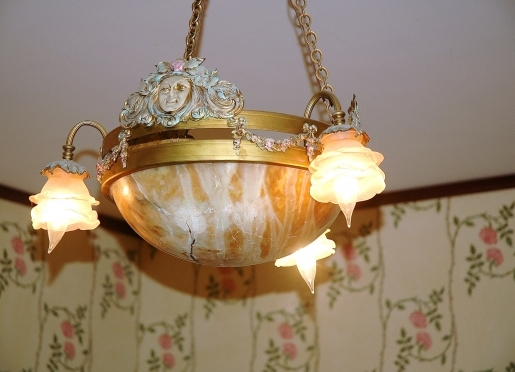 Women donated their fine china to be crushed to add sparkle to the exterior. Said to be the finest building in the west at the time, the Temple measured 128 feet by 88 feet and featured an 82-foot octagonal tower. In 1844, Joseph Smith was martyred in nearby Carthage and in 1846 mob violence forced the Saints to begin their historic trek westward to the basin of the great Salt Lake. After the exodus, the activity of the town moved to the bluff and the flats began a long period of decay. In late 1848, an arsonist destroyed all the wooden parts of the Temple, and the blackened walls were further damaged by a tornado in 1850. The City Council finally ordered the ruined remains removed in 1865. In 1849, an orderly and industrious group of French communists known as Icarians arrived in Nauvoo and were able to buy vacated properties for little or no more than back taxes. 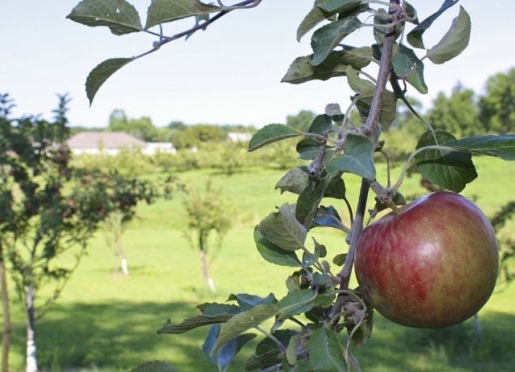 The Icarians planted orchards and vineyards and operating numerous industries, including a sawmill, large flour mill, numerous shops, a brewery, distillery and wineries. A few years later the communal way of life proved unworkable and the colony dispersed. In the latter half of the 19th century, German, Swiss, English, Irish and Scottish immigrants found their way to Nauvoo. German culture and language became dominant and remained so until World War I. The soil and climate were so favorable for raising grapes that by 1866 the town had over 500 acres in vine and numerous wine cellars. The wine industry continued to grow in Nauvoo until the days of prohibition. 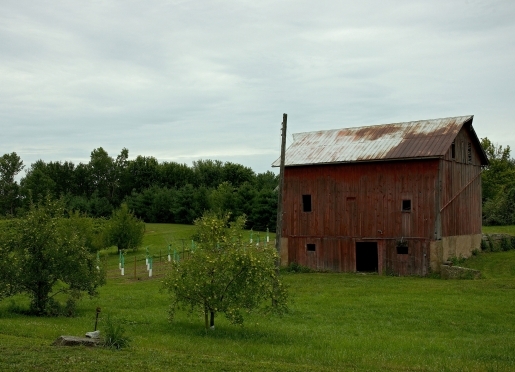 Much of the grapes grown in Nauvoo were shipped to Northern markets until much of the vineyards were converted to corn and soybeans crops. Old cellars were converted to house Nauvoo Blue Cheese, thus the rise of another famous industry in Nauvoo. Each Labor Day weekend, the Nauvoo Grape Festival celebrates these two Nauvoo industries with a pageant which observes the old French rite called "The Wedding of the Wine and Cheese." The Catholic Church also has deep roots in Nauvoo. The Sisters of St. Benedict came from Chicago and opened a school (later known as St. Mary's Academy) for the advanced education of young women in 1874. A new monastery was built in 1954, a new high school in 1957 and other additions in 1962 and 1967. Although no longer standing in Nauvoo, this complex continues to have deep ties to Nauvoo’s residents. During the latter half of the twentieth century, the Church of Jesus Christ of Latter-day Saints has returned to Nauvoo and rebuilt the ruins of many of the original buildings on the flat. The Church of Jesus Christ of Latter-day Saints along with the Community of Christ (which owns the original Joseph Smith home and several surrounding buildings), have created the "Williamsburg of the Midwest" with two visitors centers and numerous restored and furnished homes and shops which are open all year round for free guided tours. In addition to free musical theatre productions held daily on the flats, a spectacular outdoor pageant, "The Nauvoo Pageant" has been held annually since 1976 (in July). The latest chapter in Nauvoo's history began in 1999, when the Church of Jesus Christ of Latter-day Saints announced plans to reconstruct the original Nauvoo Temple. Completed and dedicated in the Spring of 2002, the exterior of this amazing $25 million dollar edifice is virtually an exact replica of the original. 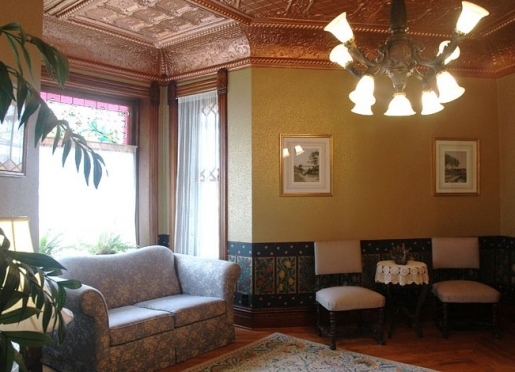 The interior has been crafted with the finest materials, replicating the original where possible while accommodating the needs of modern-day Latter-day Saints who now travel to Nauvoo year-round to perform sacred ordinance work. Cassie and Kent currently reside in Columbus, Ohio, where Kent is the Senior Managing Director for Veris Consulting, LLC, a boutique firm providing forensic accounting and expert witness services. Cassie holds a degree in Civil Engineering from Brigham Young University but has been a "stay at home mom" for the couple's seven children. Also, Cassie has a Masters Degree in Social Work from the University of Houston with honors. Kent has Bachelors and Masters degrees from BYU in Accounting and spent nine years as a CPA with Ernst & Young and 12 years as a financial executive in the insurance industry, before joining Veris in 2003. Over the past 30 years, the couple has resided in Provo (UT), Overland Park (KS), Jacksonville (FL), St. Louis (MO), Franklin (TN), Houston (TX), Keokuk (IA) and Columbus (OH).